Today in Masonic History we discuss Tracing Boards. The Tracing Board is used in masonic education and lectures. 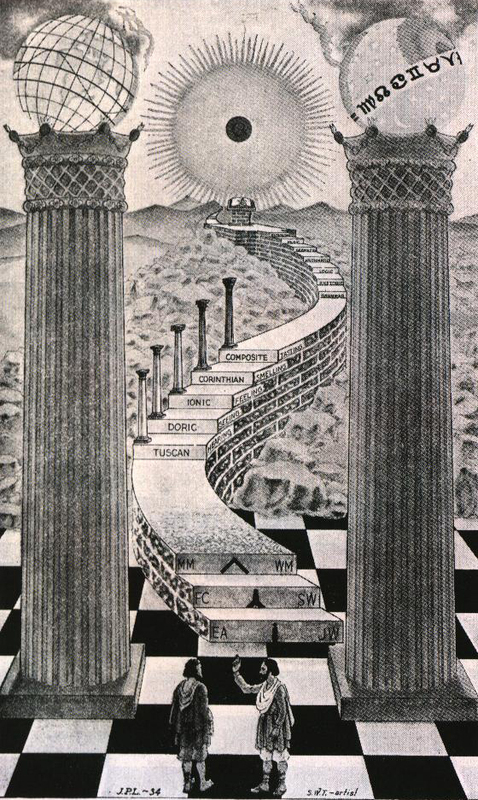 A Tracing Board is used in masonic degree work to illustrate ideas and principals put forth in it's degrees. The origins of the Tracing Board go back to the masonic lodges in the 18th century and before. In the beginning of Freemasonry, in England and around the World, Freemasons did not meet in a lodge hall. Instead they rented out the back room of a tavern once a month, or however often they held their meetings. Appropriate diagrams and other items indicating the lodge were drawn, often with chalk, on the floor of the tavern to indicate the information that they needed to convey in their degree work. Some historical reference has the Tyler, probably as part of the ritual of the time, drawing a rectangle on the floor. Possibly to represent the security of the room as would be the Tyler's responsibility. As the degree progressed, the Worshipful Master or other officers of the lodge would fill the rectangle in with appropriate images. Most of which we would probably not recognize as being part of modern freemasonry, particularly as you go back into the 18th century and before. After the degree was complete, the candidate would be directed to remove the chalk drawings with a mop and bucket. This would be a reminder of his oath of secrecy. During non-degree meetings they would still draw the chalk drawings as a reminder to the brothers of the lessons that the fraternity has taught. Sometime in the 19th century as symbols were adopted by the fraternity more permanent mechanisms were used. These ranged from painted boards that could be displayed or carpets that could be laid down for candidates to see. Despite the fact that these had come into vogue in the fraternity at the time, most Grand Lodges discouraged their use since they were now a permanent display and could not be erased with a simple swipe of a mop. By the 20th century the idea of the Tracing Board began to die out. Logically this probably coincided with more and more lodges moving from the back room of a tavern and into their own buildings. The idea that the lodge had to be 100% portable, sometimes referred to as a "lodge in a box", had gone away and it was now easier to have more permanent displays or larger items that could be used to illustrate the ideas and principles of Freemasonry. Several examples of Tracing Boards still exist and can still be used to relate the concepts of Freemasonry to a candidate.